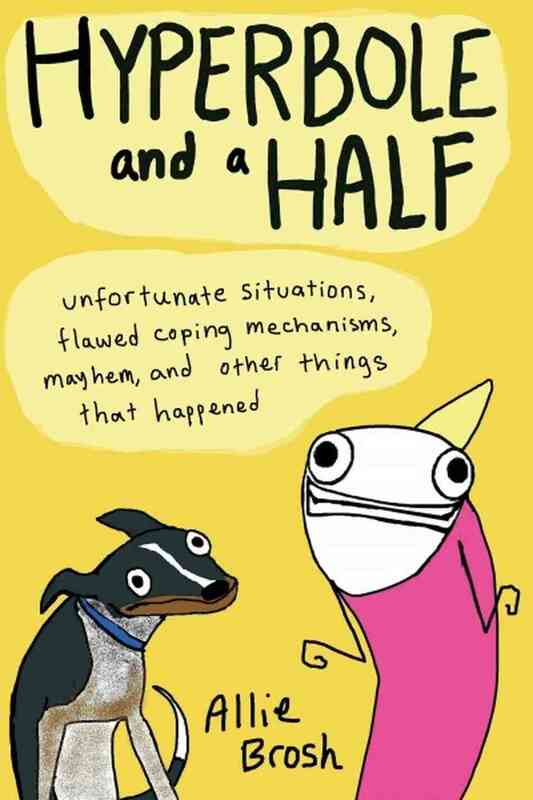 Here’s the caveat of this review: I was only passingly familiar with Allie Brosh’s blog when I bought the book. I mean, I was aware of it. I had read about the Alots (who do not feature in the book), the helper dog and the simple dog, and about Brosh’s bout with depression. I knew I like her tone, I knew I enjoyed her illustrations, so I felt pretty confident going in that I was going to enjoy this book. So when the raving reviews came rolling in I went ahead and clicked the link and bought myself the book. And I absolutely did enjoy it, although I didn’t love it. I think I enjoyed it the way I enjoy the blog. Which is to say, I enjoyed it a story or two at a time (which are handily color coded), but not in the same way I would generally fall in love with a book that has an overarching narrative. I think this is a problem that I have with memoirs of any sort – if there isn’t an overarching theme or narrative device, or a BIG THING that you’re trying to tell me I tend to lose focus and wander away. Which is probably why it took a little longer to get through reading this book than I was anticipating. Now that I’m done bellyaching, let’s talk about what you will find when you too, read this book (because you absolutely should). Allie Brosh is certainly one of the most honest writers and humorists you’re bound to come across. Each of her essays is full of introspection and views the human condition in a way that will simply make you stop momentarily and think “yup, I know that feeling”. There are many, many, many of them. And if you’ve not read her pieces on depression, well – go do that right now. Because the words she writes are true and insightful. And also amusing. This is a humorous, fun book and I have managed to write an unhumorous review. I apologize. It’s Monday. At work I am in the process of crafting several programs for our 2014 season around the servants and staff that formed the backbone of our site. And, from the 6 pages of handwritten notes I have on the topic, I think for the most part Ms. Pustz achieved her goals. Interpreting Servants’ Lives at Historic House Museums by Jennifer Pustz. This book grew out of Ms. Pustz’s dissertation and seeks to understand when, why and how domestic staff and servants are being interpreted in the Historic House museum field, and how museum professionals can expand their current offerings to offer a wider, and hopefully more accurate, view of the lives lead by all the people associated with our sites. Voices from the Back Stairs is broken up into several chapters, which really function more as sections. In the first half of the book we are introduced to the state of things now, based on the research done by Ms. Pustz as part of her dissertation. Ms. Pustz sent out highly detailed questionnaires to sites asking seeking to understand where we are as a field in relation to the bringing this aspect of social history to light. Ms. Pustz doesn’t shy away from exploring how Historic House Museums have evolved over the past quarter century, nor does she shy away from the various reasons many staffs are hesitant to discuss servants. What follows are photo essays about the servant problem, a late 19th century and early 20th century term for the difficulty in finding and retaining good help, and what contemporary interpretation of domestic service looks like today in some of the best exemplars in our field. The second half of the book focuses on using the question of the servant problem to frame interpretation of the site, and providing case studies of sites that are interpreting servants in varying manners to provide inspiration for those of us on the uphill climb. While this book was at times a bit dry (I found myself counting pages to the wonderful photo essays several times) there are perhaps few people who are more qualified to write a work of this type than Jennifer Pustz. She holds a Ph.D. in American Studies and has worked as a historian in historic house museums for more than a decade at the time of this book’s publication in 2010 and conducts and presents research as part of her day to day work. She has also spent more than a decade researching the servant problem and domestic service interpretation at Historic House Museums. 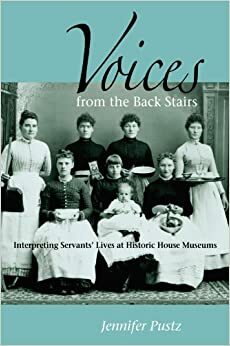 Voices from the Back Stairs was an easy read once you got going and I particularly enjoyed her discussions of both the history of servants in the United States and her case studies. But perhaps my favorite part of the book was the way she explained how necessary this type of interpretation is to what we do, and I now have a stack of quotes and resources to take to colleagues who may be less than enthusiastic about changes we need to be making. Perhaps the only change I would make would be to shorten the section on the servant problem. I feel Ms. Pustz did a great job of outlining what the problem was, and how it relates to problems that can arise in trying to interpret servant’s lives, but the explanation of how to build a tour or program around the servant problem seemed to drag on for me. This is a book I would recommend to others in my field, even if it was less of a history and more of a best practices guide. I do not however think that the average reader outside of the public history field would be as interested in this work.